A friend’s severely physically disabled daughter received two boxes of Kleenex from her grandma for her Sweet Sixteen birthday. No doubt the grandma dearly loved her granddaughter and had good intentions, but had no clue what to give a young woman who is able to physically do very little. How heartbreaking for both of them. Clothes. We all wear them! Depending on the child’s abilities and mobility, elasticized waists and zippers or Velcro, rather than buttons or snaps, would be greatly appreciated. Adapted clothes, such as from Kutaways, Mini-Miracles Children’s Clothing, WheelieChix Chix and Easy Does It (more for adults), may foster greater independence in dressing. Wall posters of their favourite hotties or current interests, whether it be Christina Aguilera or Nick Carter or anyone in between. Music CDs and, of course, something to play them on; for example, switch-adapted boom box with CD player. How cool is that! Or, even better yet, an iPod speaker system with a remote â€“ forget fumbling with CDs and jewel cases! Books are great for expanding one’s world. For those with print disabilities, large print, audio books or electronic books may be appreciated. Make-up and jewelry: a must for all teenaged girl! Great tips for adapting a make-up kit. For the young men with disabilities, shaving kits and related items. Gift ideas from the experts. Visit AblePlay for information and toy reviews suitable for children with disabilities. Currently in its 11th year of publication, the Toys “R” Us Guide for Differently-Abled Kids evaluates the listed toys and helps millions of people choose just the right toy for the children in their lives with disabilities. By giving some thought to the individual’s interests and abilities, as well as to the disability, there are many gift ideas that are more exciting to give and to receive than a box of Kleenex! What ideas can you add to the list? Note: The companies and products mentioned here are offered as suggestions, as a starting point. I have not had any dealings with them. 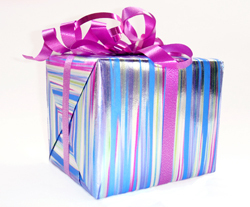 If you have dealt with companies, your comments on their products or on further gift ideas are most welcomed. Happy giving! Another thing to consider is paying for a day at Chuck e Cheese or an arcade– something my youngest kid LOVED when he was five! Awesome idea, Karen! Sounds like fun. Glenda, you are a fount of helpful information! Thanks Glenda for including our information on your blog!!! Yours is a very informative blog. Thanks for providing this wonderful content. Gifts are source of happiness to both the giver and the recipient. Thanks for the ideas.